Finally a complete suite of Windows XP Desktop enhancement, XP Visual Tools is loaded with all you need to tweak your Windows XP Desktop. Now you can do anything you want, from changing transparency level of XP Start Menu and XP Taskbar to easy swapping between different Windows XP LogonUI or Windows XP Wallpapers and applying Windows XP Skins (XP Themes) to old programs. XP VISUAL TOOLS remains user friendly and easy to use even if it's so powerful! Feel free to download any Windows XP Wallpapers and Windows XP LogonUI and manage them easy with this new Windows XP Utility! Suite of controls windows form original and innovative for Visual Studio 2008. Qweas is providing links to XP Visual Tools 1.8.7 as a courtesy, and makes no representations regarding XP Visual Tools or any other applications or any information related thereto. Any questions, complaints or claims regarding this application XP Visual Tools 1.8.7 must be directed to the appropriate software vendor. 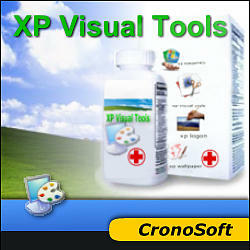 You may click the publisher link of XP Visual Tools on the top of this page to get more details about the vendor.